2. Do I have control of when the payment is made, i.e., is it an off the top deduction from my pay? Do I have control over the amount; is it a variable expense? 3. Is there a risk or consequence if not paid, i.e., repossession of a car if the loan payment is not made or garnishments from pay? 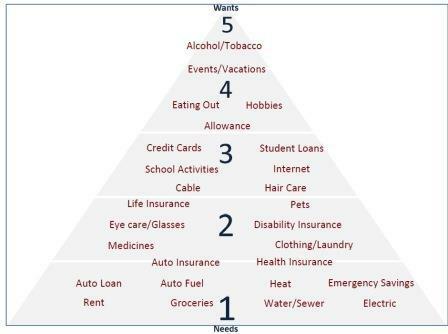 Another way prioritize expenses is to use a spending pyramid. This is a visual way to see your expenses, with the base (#1) containing the most important items needed for stability. If you don't pay those items, your pyramid would be unstable and likely to fall. (Many also include typical items taken off the top from wages, as they are automatically 'paid' first.) Fill in the rest with your expenses according their importance (to you) for being paid. Keep in mind that the top of the pyramid (#4 & #5) should be those things that, if removed, won't affect the stability of your pyramid (wants). Below is an example of a spending pyramid. 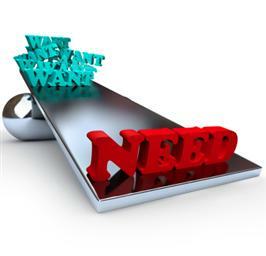 Click on Spending Priorities to access the worksheet to help prioritize your expenses. There is no right or wrong way to fill in the pyramid. Remember, you are in control! And how do we make money decisions? Click Steps to Effective Money Making Decisions to help guide your own decision making.